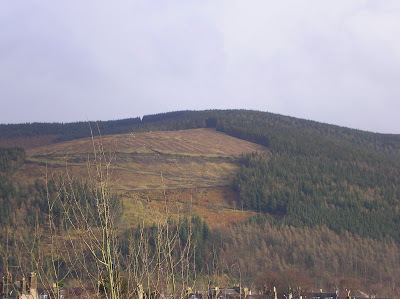 When we arrived in the sleepy village of Innerleithen (Peeblesshire), we were quite unprepared for what was ahead. After checking into our quaint B&B I stood at the window admiring to glorious views of the hills. My jaw nearer hit the floor when I spotted an ant-like line of runners reaching the top of the hill (which looked like a mountain) in the distance. I knew it must the Deerstalkers' 5K race. But what the feck were they doing all the way up there? With a gulp and glance, we knew there was trouble ahead. Of course we had signed up for the Mighty Deerstalkers race, which was longer and in the dark. 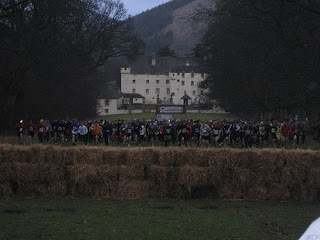 Here's what it says on the tin: "The Deerstalker is a turbo-charged roller coaster of a run. It's fun, it's fast, it's action-packed and it's as tough as you can bear. This is Fun Run meets Fell Race meets Hellrunner meets Tough Guy. It's Rat Race in the countryside. The onus is on fun but this is also a serious challenge, involving off-road terrain, steep gradients and exciting obstacles". As with most of our journeys, the adventure begins before we even got to the start. We were late and scuttled about trying to find the registration and the start. Marco had to abandon the car (his car, thankfully) in a field, which was used an overspill carpark. And then I sent him sprinting back because I forgot my head torch. We lined up behind a haystack bundle, next to the most randomly dressed individuals I've ever seen. Of course, there was an abundance of deerstalker caps, tweed jackets and antler hats. But I failed to see the connection with pink tights, red Indians and boys in dresses. I think Sonic and I were amongst the few who weren't embracing the fun of dressing-up. Sonic was completely rebelling and went head torch free in a pair of road shoes. I'm sure you'll read all about it in his blog. Maybe even before next year's event. For the first half of the race, the pace is pretty much dictated by the person in front. On the ascent we ground to a stomp as the "runners" in front slowed down. I tried not to get frustrated, as there was no way I could get past. The track was only about 1m wide - about the same width as the bloke's ar*e in front of me. At the top I had to wait in a queue for seven minutes, as the steward filtered us over the beam walk obstacle. There was a Disney-like couple in front of me wearing t-shirts with pictures of each other on the back. Isn't that the cutest thing!? As if that didn't make me feel nauscious enough, the guys behind me drinking whisky from a half-bottle. Once we were over this section, the field spread out. Or maybe because I widened the gap, as I practically bob-sleighed on my backside all the way down. And the fun continued. Icy-cold swamps and waist-high river crossing, steep inclines, even steeper descents, narrow paths, walking the plank, obstacles, muck, climbing fences, swinging branches, scree-clad hills, abseiling on rope as secure as knicker elastic...all tackled in the black of night. Directed only by the light from other runners - as there wasn't a steward in sight. I lost the ar*e of my tights on a barb-wire fence, burnt my hands on the rope, had at least a dozen spectacular falls, ran 300m up a river against the current (now I know how a salmon feels), squirmed whilst wading through sewage-like substance and practically cried when I realised I was alone at a river crossing. Searching for the race tape which marked the course, I was elated to see head torches coming towards me. There was a real sense of comarderie amongst the troops. Every time I went a*se over elbow there was someone there to scrape me up. Couples ran together and teams waited for each other to catch up. Of course, Sonic was nowhere to be seen. As soon as the horn went he was up the hill like a rat up a pipe. Even as ill-equipped at he was. Although I crossed the finishing line looking like I'd just crawled out of a swamp, I truly enjoyed the amazing experience. There was no point in race that I wanted it to be over. There was every point in the race when I wondered how the organisers got away with it though. It's a health and safety nightmare...just the way I like it. Now all you need is to enter a full blown fell race and you'll be rescued from the evils of the lycra clad road and into the ale warmed marvels of fell and mountain running. Weehee! Enjoyed the report:) Well done. It staken me this long to figure out how to get to see your blog! OMG what do you guys get up to? Sounds right up your street though and great fun!